Fire the incredible twirling night copter up to 300ft into the air and see it gracefully twirl and glide back to earth in mesmerising style! 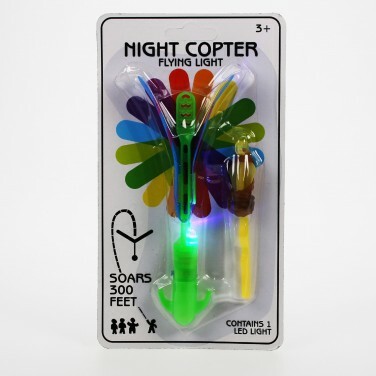 Inspired by the sycamore "helicopter" seeds in nature, this addictive toy copter is lit by a blue LED so that you can track it's hypnotic flight time and time again! Shoots up to 300ft into the air! 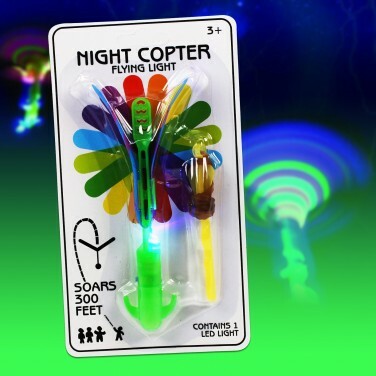 Twirling Night Copter The ultimate night flyer, the Twirling Night Copter launches up to 300ft in the air before twirling to the ground in a hypnotic display! Unpredictable and lots of fun the Blinking Boggleball flashes and bounces in all directions in a crazy light show! The yo-yo for the next generation, kids will love performing endless tricks with Zing Thumb Chucks! 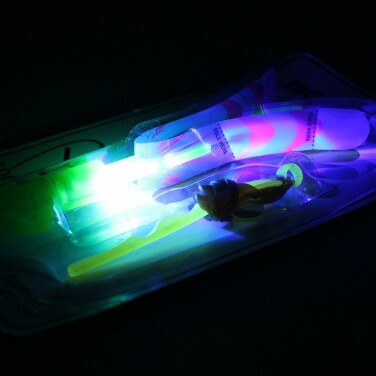 With a striking glow in the dark design, this poly glider plane will capture your child's imagination with elegant aerial displays! A hypnotic little spinning top that's big on effects, spin and see it come to life with circles of colourful light!